I don't know about you, but I love sweet potato fries. I might even love them a little more than regular ole fries (and they are healthier - especially if you bake them)... But I never seemed to be able to make them at home. They always seemed to be too soft and I never could get that crispy coating. One day I stumbled on this recipe and decided to give it a try. It worked!!! It worked very well. A big thanks to theartofdoingstuff.com for the guidance. 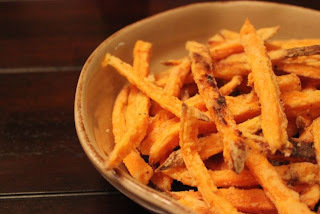 I hope you'll enjoy these truffled sweet potato fries as much as I do. They are luscious. Peel sweet potatoes and cut into fries about 1/4 inch thick. Place the cut potatoes in a bowl and cover with water. Allow the potatoes to sit for 1 to 2 hours. Add corn starch to a large plastic bag (I used a gallon ziplock bag). Hold the top of the bag closed and shake to distribute the corn starch. Toss in some of the sweet potatoes and shake to coat. Place coated fries on a baking sheet. Repeat this process, adding more cornstarch to the bag as needed, until you've coated all of the fries. Drizzle the fries with olive oil and toss with your fingers so they are evenly coated. Arrange fries on the baking sheet so that they are not too crowded and in a single layer. Bake the fries for 15 minutes. Flip the fries using a spatula and cook for another 10 minutes or until lightly browned and crispy. Remove fries from oven and immediately sprinkle with truffled sea salt. Serve right away. These are delicious and luscious without anything to dip them in. But I also like to serve sweet potato fries with a little sweet chili sauce (available in the Asian section of most markets).